Due to the popularity of our Shirt Rewards Program, we’re extended it so more of our clients can take part! To sign up, you must purchase 5 or 10 shirts by January 31. You’ll receive all shirts at a 25% discount and we’ll also give each a $50.00 or $100.00 gift card to spend on our custom suits. Receive a 25% discount on our dress shirts when you purchase or prepay for 5 or more dress shirts. This roughly translates to about $109.00+ per dress shirt. Buy 5 qualifying dress shirts and you’ll receive a BONUS $50.00 gift card to spend on a custom suit in our B Collection or higher. Buy 10 or more qualifying dress shirts and you’ll receive a BONUS $100.00 gift card to spend on a custom suit in our B Collection or higher. Get notified of new shirt fabric arrivals. Receive early access to exclusive shopping events and whiskey tastings at 9Tailors. Want to make an appointment? Contact us at info@9Tailors.com or at 617.286.6135. Receive a 25% off on shirts when you buy 5 or more dress shirts in C Collection or higher. Buy 5 shirts, you’ll receive a $50.00 gift card towards a B Collection suit or higher. Buy 10 shirts, you’ll receive a $100.00 gift card towards a B Collection suit or higher. 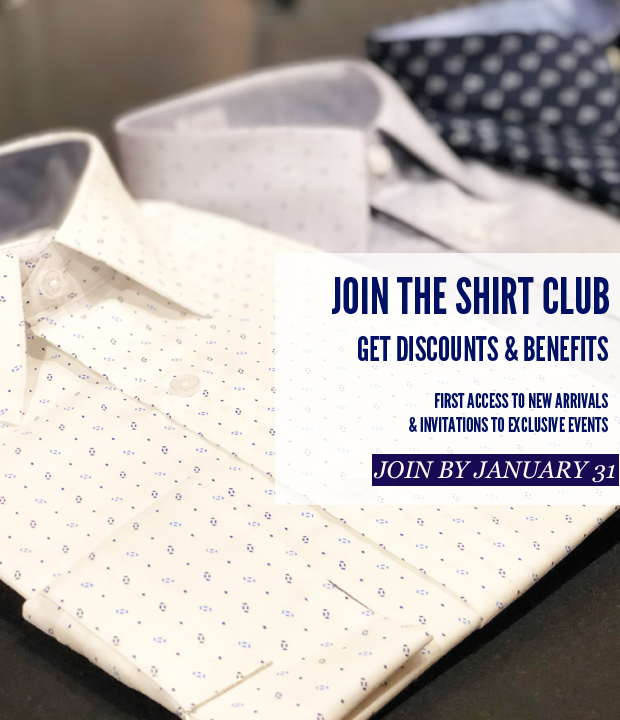 If client prepays for shirts, client can request to order all shirts at one time or order any time through December 31, 2019. If client does not want to place the shirt order by December 30, he/she may opt to pay in full. All prepayments or deposits must be collected by December 30. A la carte design options are not included. Sale period: December 19, 2018 – January 5, 2019.